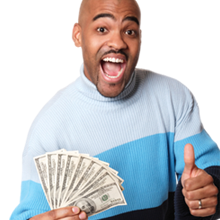 If you need a cash advance loan in Ohio, then CashLoan.org can help you get one quickly, efficiently and confidentially. Sure you could apply for a bank loan or drive to a local cash advance store, but why spend the time, energy and gas? The fastest way to alleviate financial emergencies is with a fast, secure and confidential loan from CashLoan.org. CashLoan.org can help you immediately - no credit checks, just the money you need to get out from under your economic problem quickly. You can APPLY NOW online, or you can contact us. Residents in most states can take advantage of CashLoan.org’s reliable, confidential and secure service. Ohio state law requires cash advance lenders to be licensed. The written contract from the lender must clearly state the terms owed to the creditor. Lenders are prohibited from entering into more than one contract with a borrower at one time. Payday advance lenders may pursue civil action against a borrower for a defaulted loan. $800 is the maximum payday advance loan, excluding fees, allowed by law. Loan terms vary, but cannot exceed a maximum of 6 months. Ohio law does not permit extensions or rollovers. Finance fees cannot exceed $10 per $100 of the amount borrowed plus a 5% monthly interest. A lender may also charge no more than $20 for a check collection fee.